Arsenal and Manchester United look to have been dealt the blow of potentially missing out on the transfer of Samuel Umtiti, who wants to stay at Barcelona. According to Marca, the France international is not interested in leaving the Nou Camp, despite the piece referencing recent speculation that Barcelona are trying to offload names this summer in order to fund a move for Ajax defender Matthijs de Ligt. Umtiti has been linked with both Arsenal and Man Utd recently by Mundo Deportivo, but it now seems neither club will stand much of a chance of bringing him in this summer. Of course, it may be that Barca will force the issue by just offloading the player anyway, but there seems little sense in forcing out a quality performer like Umtiti when there are other squad players who could also be sold for decent cash. 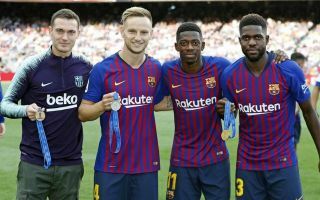 It might be interesting to see, however, if Umtiti could change his mind about staying with the Catalan giants if they do end up replacing him with De Ligt this summer. He would surely be guaranteed more playing time at Arsenal or United, both of whom are weak at the back and urgently need a big-name signing like that to come in if they are to stand any chance of going from scrapping it out for a top four spot to becoming genuine title contenders next season.